Are you proactive or reactive when planning for life’s next chapters?Whether considering your options or a loved one’s, it is essential to know the benefits of advance planning for life’s next chapters before a crisis occurs. Taking a proactive approach reduces stress and increases satisfaction every step of the way. Family caregivers and aging seniors can relax while assessing their needs and comparing options available. Rushing into vital decisions while sitting at your loved one’s bedside—or while in a hospital bed yourself—is less than ideal. Aging can bring challenges, but doing your homework in advance can make the aging process smoother, healthier and happier. To help educate people about their many options, Seniors Blue Book is holding it’s Our 8th Annual Senior Living Symposium. This year it will be held at The Shell Point Retirement 9:00am to 3:00pm . Enjoy Five educational panels and 50 vendors with information to share. Event is free with a continental breakfast and lunch provided. 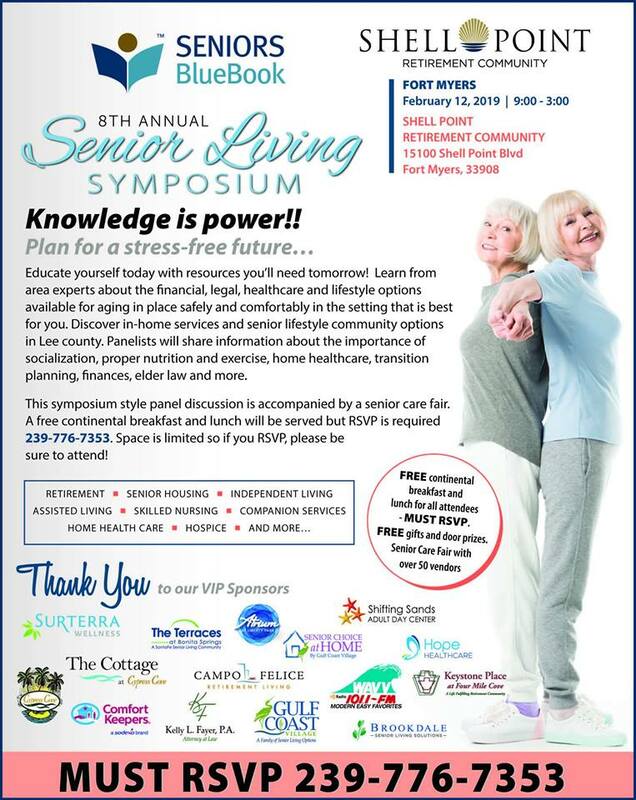 For Additional Senior Living Symposium information and registration, call 239-776-7353 or email Alittrell@seniorsbluebook.com.